Black Maple Hill is a bourbon that friends have been recommending for a while now, but I haven’t gotten around to tasting it until now. It’s become a common sight in the growing number of bars in NYC that stock a decent selection of bourbon – so it’s clearly not an under-the-radar newcomer. In fact, it’s apparently produced by Heaven Hill so there’s significant heft behind this brand. Looking forward to seeing what it’s got. Black Maple Hill’s bottle is understated compared to some other bourbons you’ll find in this range. The label uses just one color and that color very closely matches the color of the whiskey inside, creating a soft melding of all the bottle’s elements. The proof is listed in faux handwriting, but the etching on the main front label avoids this type of approach, rather the simple horse/forest scene pushes the eye up toward the brand name at the top. 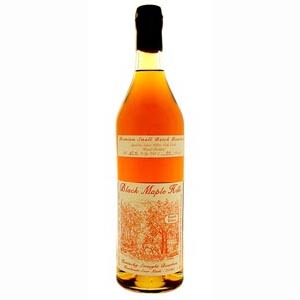 To the nose, Black Maple Hill comes across first as dominated with charred oak but it seems like there’s something young about it in the background with corn and alcohol sneaking through. On the tongue, however, the first impression is a peppery burst, which gives way to a full-mouth sensation of dry summer grass. This builds up to a nice grainy sensation then dies down into a medium-warm, medium-long finish. I like this, but it’s not my favorite. I’d like to see a better texture to this bourbon, which otherwise feels quite light. That said, I quite like the ‘dry summer grass’ notes to it and this might (just maybe) be something I’d have with a cube of ice – but I reserve the right to take that back. Apologies for the poor picture-quality, I still can’t find the charger for my camera battery. I made a trip to Astor Place this weekend to pick up my next few bottles. Catching my eye down there at the bottom shelf was Cabin Still with its bright yellow label and trying-too-hard name, so I put it in the basket along with my other selections and hoped for the best. At $10.99, that’s not hard to do. Further investigation revealed that Cabin Still is a Heaven Hill product, which bodes well. Let’s see how this goes. That yellow label is the most distinctive element of the Cabin Still bottle. The centerpiece is a print of a copper pot still framed by the phrases “Hand Made” and “Sour Mash”. The main text of “Cabin Still” is in a font that I don’t think I’ve ever seen before, but it – along with the decorative swirls around the edges – highlights the almost goofy character of the design. It has taken the idea of the bourbon bottle and taken it to cartoonish lengths. As much as I get fed up with the over-reliance on nostalgia in American whiskey packaging, I find myself more amused than frustrated. I especially like after thought of a red stripe in the top red corner. To the nose Cabin Still is sweet, medicinal, and a bit of new car smell. On the palate, CS is barely there. It starts off with a watery grain and under-aged sort of profile then drops into a faint char and a slight pepper on the finish. Cabin Still is nothing to write home about. I’ve had worse as parts of bourbon & cokes before, but I don’t think I’ll be sipping this on its own any time soon. This is the first rye I’ve tasted for American Hooch. Why Rittenhouse? It’s a brand I’ve seen in many bars – a brand that’s constructed some of the finer mixed drinks I’ve tasted – so it seemed like a good place to start. Rittenhouse Rye’s 100 proof line comes in the standard cheap-liquor bottle with the plastic cap, but its black label and well-known name makes it stand out from the crowd. The label consists of familiar American whiskey motifs: the barrel, the flowing script, and the proud declaration of its bonded status to name a few. There is no mistaking RR for anything else but a classic American rye. Rittenhouse provides a nose full of lemon and mashmallow. It is very sweet through all of this. There are points when the alcohol sneaks through, but that’s probably because your nose is too close. To the palate, RR displays the lemon certainly, but the dominant flavors are black pepper and licorice. All this is front-loaded and dissipates quickly after the initial sensation, leaving a mild peppery finish. That first wave of flavors, however, is suitably complex and pleasantly angular. I enjoyed the angularity and peppery beginning to Rittenhouse, but was let down by its quick dissipation and lacking finish. So, I’m not sure where I come down on this one – it would make a fine mixed drink, but a lackluster sipping selection. Though I’d be lying if I said I didn’t pour myself a second helping. My apologies. It’s been a few weeks since I’ve been able to get around to blogging here. The first delay was on account of going to a Bulleit tasting at the Brandy Library (it got a little rowdy for the BL) and the second delay was from me being off in Germany last week where bourbon is not a priority for the locals. Now that I’m back, I’ll try instituting a new section to the regular posts, a “Stats” section which will list price range, proof, and maker – thanks for the idea, Dave! First up on my return: Old Fitzgerald 1849. On my last trip to Lenell’s, I specifically asked for something from the lower end of the price-scale. Both my wallet and my instincts were telling me that I’d been focusing a bit too heavily on $30+ bottles and it was time to look a little lower. I’d had good experience with the Old Grand-Dad Bonded, so surely there were other gems among this, the everyman’s liquor. I think it was Ingrid there who recommended OF1849. Before tasting, I did some quick internet-research and found that you can’t go very far without coming across accolades for OF1849 as a bourbon with a high quality-to-price ratio. These are high stakes that were set up for the product. I hoped it would stand up to them. During my research I was particularly trying to find out where the 1849 date originated. It turns out that it’s from the founding date of W.L. Weller & Sons, the previous owner of the brand. Originally it may have been called Weller 1849, but subsequently changed by Heaven Hill. Sure, it’s not something that jumps out at you from the shelf, but its uncool aesthetic makes it come closer to that ever-desirable “authenticity”. If you needed any further proof of the uncynical design choices, look at the bottom of the label where it declares in the most unironic of phrases: “Distilled and aged expressly for [line break] Connoisseurs of Fine Bourbon.” Excellent. 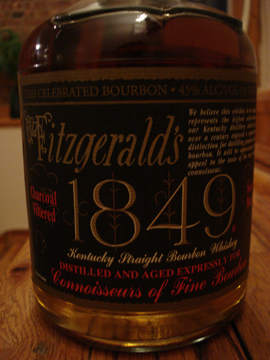 Old Fitzgerald 1849 has one of the strongest open-bottle-whiffs of anything I’ve tasted so far. As soon as you crack that plastic cap, you receive a distinct scent of freshly-picked apples. After pouring it, the apples continue, but are accompanied by mowed-grass, corn, and a distant mint – simple but pleasant. On tasting OF1849 was not as smooth as I’d expexted, exploding onto the tongue. This develops, however into caramel apples, some oak, popcorn, and tres leches cake. In other words, this is certainly sweet. The popcorn which develops in the middle adds an interesting contrast to the rest of the swirl. There’s also quite a nice mouth-feel to it and a spicy-to-clean finish. I have to admit, what they say about Old Fitzgerald 1849 is right. This is a damn good bourbon for less than $20. While not as prototypical as Old Grand-Dad, there’s plenty to it to keep you interested that more expensive choices lack. Well done.